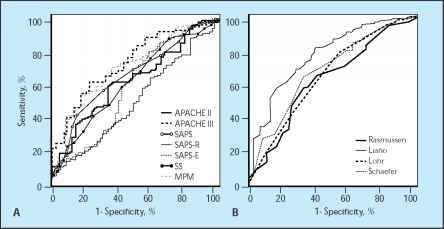 Sepsis-Related Organ Failure Assessment Score (SOFA)  are those that seem most suitable for this purpose. APACHE II used to be most used. Other systems (white boxes) have been used in ARF. On the other hand, at least 17 specific ARF prognostic methods have been developed [20,30]. The figure shows only those that have been used after their publication , plus one recently published system which is not yet in general use .